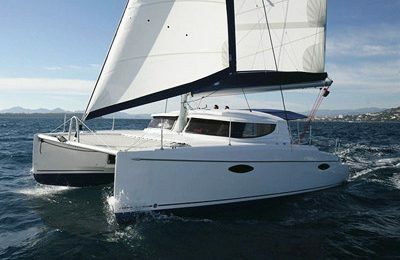 Charter this stunning 38′ Bavaria sailboat out of Barcelona, sail away to the fantastic Balearic islands. This 38′ sailing yacht is from German yacht builder Bavaria, built at 2005, with a solid hull along with easy to handle rigging, yet great sailing performance. You will easily reach 7 – 8 knots while under way. Furling main sail and jib, up to date electronic system, there are 3 bed rooms and 1 rest room below the deck, ideal for having a great sailing week with your family and friends. The yacht holds up comfortably for 6 – 8 Adults, come with full kitchen and 3 sleeping quarter, 1 restroom. A ideal weekly yacht charter route is to sail across to the Balearic islands or the mainland Spanish sea coast. Base price includes 7 days bare boat rentals with insurance and VAT, tax, basic linens and a tender. Skipper for hire at $180 a day, Outbound engine $20 per day. 2005 38′ Bavaria sailboat, 3 double sized sleeping quarters, 1 head, hot water maker. Rigg 9 / 10 Selden, with main and genoa Elvstrom. Genoa with standard foresail reefing gear. Mainsail with standard foresail reefeing gear Furlex. Volvo-Penta D 2-55 ,55 hp Sail-Drive . Autopilot Raymarine ST. 6000 Plus. Tank content: 300 l in 2 tanks. Chart table with large compartment for nautical charts and navigation instruments. Charts, pilots, and tools for navigation. Fluorescent light for deck 12V. Several types of 230 harbour sockets. Full insurance & assistance insurance. Parachute signals, rockets, distress rockets. 1 ring with light and rope.